« Media Bias about Greece, or Media Stupidity? Even though he is a foolish statist, I wanted Francois Hollande to win the French presidency. 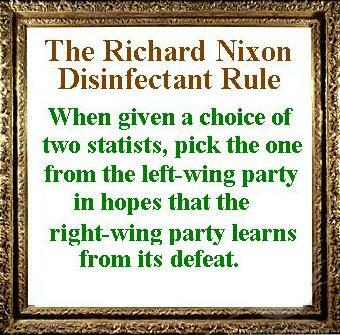 Sarkozy was a statist as well, after all, and my “Richard Nixon Disinfectant Rule” says that it’s better to have the out-of-the-closet statist prevail in such contests in hopes that the supposedly right-of-center party can then regroup and offer voters a true choice in the next election. But I have another reason for wanting Monsieur Hollande. Simply stated, we need role models. Not only role models to show the effects of good policy (like Estonia and Hong Kong), but also clear-cut examples of nations that do the wrong thing. I fully expect France to be that kind of role model over the next few years. Particularly if Hollande follows through on his scheme to push the top tax rate to 75 percent. I’ve already written about the experiment America conducted in the 1980s, when Reagan lowered the top tax rate from 70 percent to 28 percent. Hollande wants to conduct a similar experiment, but in reverse. Indeed, we’re already seeing the potential impact of class-warfare tax policy in France. Here are the key passages from a report in the Financial Times. In other words, just a productive people “vote with their feet” by escaping from high-tax hell-holes like California to zero-income-tax states such as Texas, the same phenomenon exists for people crossing national borders. This means Mr. Hollande is going to learn an interesting math lesson: 75 percent of zero is a very small number. The Laffer Curve lives! And left wingers who pretend it doesn’t exist learn very unhappy lessons. P.S. Here’s a good joke about Texas and California, and here’s a serious post about the differences between the two states. I love the way Milton Friedman used to look at countries in his film “Free to Choose” and show what their experience has been. Dan, you are so good at doing the same!!!! Over and over in the past Max Brantley and his liberal friends at the Arkansas Times have said that they don’t want budget cuts but they want taxes raised on the rich. In France their recipe for success is about to be tried and we will see how it works out. We will see how that experience in France works out. I never liked Sarkozy. I welcome Hollande. Genuinely curious as to how well the Nixon Rule has worked in Britain. Cameron doesn’t strike me as much more conservative then Tony Blair despite Brown’s brief rule. Was Brown not liberal enough to provoke a stronger backlash? Or am I selling Cameron short? Well we clearly need one world-wide tax system so that these rich people can’t escape paying their fair share! While in theory I agree with you about the salutary effects of lessons learned (and relearned), politicians never seem to learn; look at Pres. Obama’s plans to raise taxes in the land of Reagan. To paraphrase; wisdom is wasted on politicians.